This 1 Secret Will Get You Back To 100% So Much Faster. 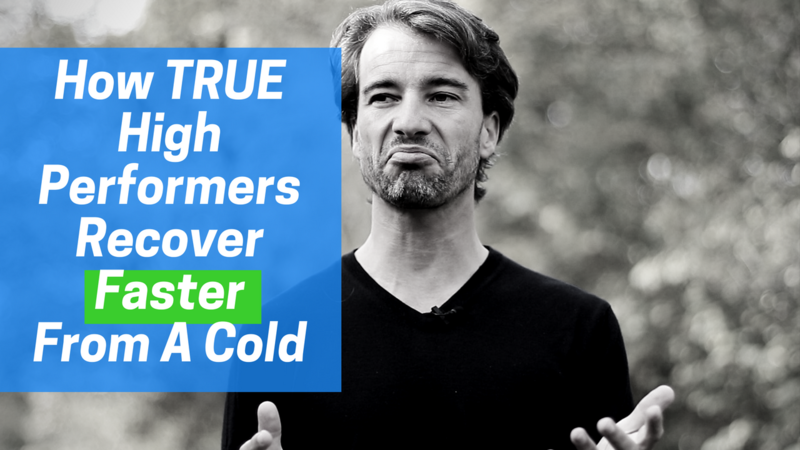 It’s this time of the year again where people start catching a cold and getting ill. Today, I wanna talk with you about the 1 secret why high performers recover so much faster from a cold or illness than other people. How many times did you go to work with a heavy cold or illness? If you are like most other ambitious people it happens at least once every year.And it’s always the same right?! Our productivity is like we are drunk and it takes ages to come back to 100%. So why do we do this? The reason is because we don’t wanna let our team members down… we wanna impress our boss and our clients how committed we are… and if we are honest we want to prove ourselves how tough we are. But the truth is… working with a cold or illness is neither committed, nor tough. It’s just stupid! Because it’s bad for everybody. We sacrifice our health and we cannot support our team and our company on our highest level. True high performers take a completely different approach. They have this one secret how to recover faster from a cold or illness. Most people do not even realize when they get ill. They wait until they stay at home when their illness is at its peak. But true high performers react immediately. As soon as they realize that their performance drops below 100% they react and take a break.They take action right at the beginning before the illness can even take off. 1. True high performers have a high self awareness! True high performers scan their body, mind and their system constantly to check if everything is running smoothly. If they realize an error in their system they react instantly. 2. True high performers have the courage to rest! They don’t feel guilty, or bad or unproductive when they take their time to re-energize to get back to 100%. They have the courage to rest and to take a time out. 3. True high performers have the patience and discipline! True high performers have the patience and even more important the discipline to do anything that is possible during the time out like 8+ hours sleep, proper hydration and great nutrion to get back to 100% very fast. As a result of this approach true high performers come back to 100% so much faster and outperform all other people who continue to work at a very low productivity level. And always keep in mind my friend… you can only work as hard as your ability to recover!